First step to prepare this recipe is to preheat oven to 375 degrees F.
Second step : is to pat chicken dry & pute in a greased 9x13 pan. 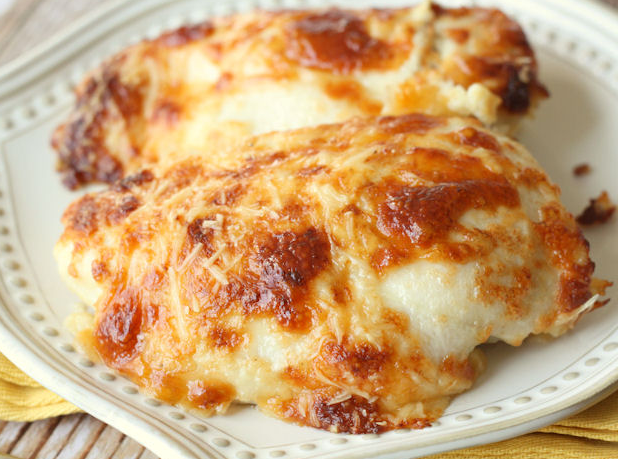 Then add sliced cheese on top of chicken breasts. Step 3 : Now use a bowl mix mayonnaise, sour cream, half cup of Parmesan cheese, salt, pepper & garlic powder. Step 4 : Now spread this over chicken & sprinkle with remaining Parmesan cheese. Then finally bake about one hour.